Concept SL-100 LED Solar Security Light Review – Should You Get It? Home/Tools/Concept SL-100 LED Solar Security Light Review – Should You Get It? If you are a home owner, what do you thinking is your biggest concern? I would say keeping your family members and your household items safe. Therefore, it is understandable you will spend lots of money to install modern security gadgets just to make your home safer. Nowadays unemployment is the largest crisis that we are facing so that it is a known fact that there is a large increase in the incidents of looting, theft, burglary and murder. Just look at what happened during the month on August 2011 in London. One of the main reasons of theft in a neighborhood is dim lightning arrangements at almost every house at night. Think about it, the thieves feel safer in dark areas since no one can see what they are up to. Hence, in order to make the thieves uncomfortable, there is a need to provide sufficient lights in some dark areas around your house at night. That is where the Concept SL-100 LED Solar Security Light comes in handy. Firstly, the Concept SL-100 works using solar cells which are charged during day time using solar energy, and it is capable of providing sufficient light at night time. 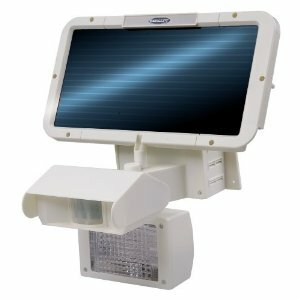 SL-100 32 LED solar security light is a simple gadget which will deter thieves to make an attempt to break into your home as they feel uncomfortable around bright lights. The Concept SL-100 has a motion sensor built in which projects an infra red beam which is not able to be seen by the human eyes. When a person comes nearer to the light and crosses the IR rays projected by the SL-100, the circuit gets opened and the LED fitted on top of your house will be activated. This will make thieves uncomfortable and he’ll think twice about breaking into your home. The Concept SL-100 has a very compact and attractive design. It comes with bright LED lights which can be used in areas such as driveway, patio, garden, entry point, and even around trees in your backyard. As the SL-100 is built using materials which can withstand harsh environment such as rain, snow, wind and even high temperatures, the product will last for a long time. Since there are no electrical wires to mess with, the solar security LED light can be easily installed. Is it worth your investment? Well, it is a small price to pay to keep your family members safe at night. Click on the button on the right and head over to Amazon.com to get a unit of Concept SL-100 delivered to your home right now. I have come to find that many people enjoy the security that having solar security lights give them. I would recommend it for anyone living in a shifty neighborhood or for those who store many valuable in your home. It’s also a good idea to have the flood lights ready when you have a babysitter at home. That way he or she can feel safe.